Akbar is the third emperor of the Mughal dynasty. He is the son of Humâyûn and the grandfather of Shah Jahan, the future builder of the Taj Mahal. 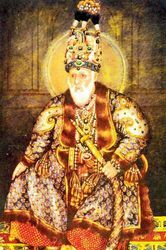 He is the first of the Mughal emperors who can actually administer his empire, his two predecessors only conquering territory or seeking to restore order after rebellions. He was born on October 14, 1542 in Umarkot, a city in Sindh province, currently in Pakistan. His father Humayun had fled his empire, defeated by Sher Shah Suri, an Afghan king who created a kingdom on the territory of the Mughals during a moment of weakness of the empire. He spent his childhood in exile with his father and four preceptors who failed to teach him reading and writing, although he has obvious intellectual abilities. Having gone to Persia to seek help from Shah Tahmasp I with his father, he reconquered his territory, battle after battle. When the Empire was reconstituted, Humayun reigned only one year, dying in 1556. Akbar was then 13 years old, a regent was named, Bairam Khan, and at the same time the young Akbar was crowned king. The ceremony was held in Kalanaur, Punjab. Four years later, Akbar frees himself from the tutelage of his regent and takes charge of his Empire. Of course, as often, the regent did not hear it that way and tried to overthrow the young king but this attempt was unsuccessful. Once Bairam Khan finally left, Akbar made his first decisions. The reign of Akbar is characterized on the one hand by new conquests, on the other hand by the establishment of an advanced organization of his Empire. As for the conquests, Akbar first faced the army of General Hemu, a former leader of the Afghan army, who still occupied the entire East of the former Mughal kingdom (Bihar, Bengal). The North of India was then divided in two, in the West, the Mughals, in the East, the Afghans. Dominance from one side to another was inevitable, and this happened in 1556 during the second battle of Pânipat. It took place exactly on November 5, 1556 between the 10,000 Mughal horsemen and the Afghan forces, and the victory returned to Akbar. Hemu was captured, decapitated and his skull exposed in Kabul to deter Hindus from rebelling. You must know that Hemu was of Hindu origin. Akbar returned to Delhi without much resistance, but when he returned he had to go back to the Punjab to arrest Sikandar Shah Suri, who was raising other troops. He was quickly arrested and exiled to Bengal after the siege of Fort Mankot was completed. The victory of the 2nd battle of Pânipat was the real starting point for the reconstruction of the Mughal Empire. From there Akbar took 8 years to recover all the territories that had been conquered by his grandfather, reforming an Empire from Kabul to Bengal. Akbar then pursued conquests on the borders of his kingdom. In 1567 the Rajputs provinces rebelled, especially that of Mewar. As Akbar had not yet made all the reforms that would make him an accepted sovereign, if not loved, he had to attack Rajasthan and besiege Chittor, the capital. Once the city was taken he had a massacre, just to mark the spirits. However, despite this, the Mewar leaders escaped and were able to return to power, once Akbar left. The Mewar was never taken over by the Emperor. In 1573 he attacked Goujerat, then Bengal in 1576, marking the end of the reconquest of the East. In 1585 his brother died, he was king of Kabul and as such his inheritance falls on Akbar, who sees his empire grow. He also receives Kashmir at the same time. His victory over Goujerat pushes him to adopt a new capital. 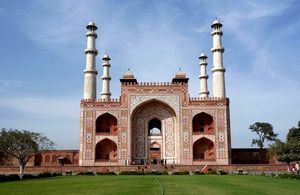 He left Agra for Fatehpur-Sikri, a new city near Agra that he fashioned following a mixture of Hindu and Muslim styles. This city will be a bit archetypal Mughal cities that can be characterized by bi-culturality. However it will be quickly abandoned (1586) because it is not fed correctly with water. As a result, Akbar will rule his empire from Lahore. In 1590 the Mughal troops attack the Sindh, which fall into their pockets. Sindh is the southern part of Pakistan. In 1592 the Odisha falls, the region south of Bengal on the east coast. Finally in 1594 Balouchîstân and conquered, a region north of Kashmir. Thus at the end of the 16th century the Mughal Empire was never so wide. 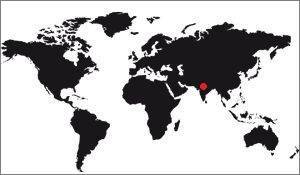 It stretches across northern India, overflowing into the territories of Pakistan and Afghanistan. 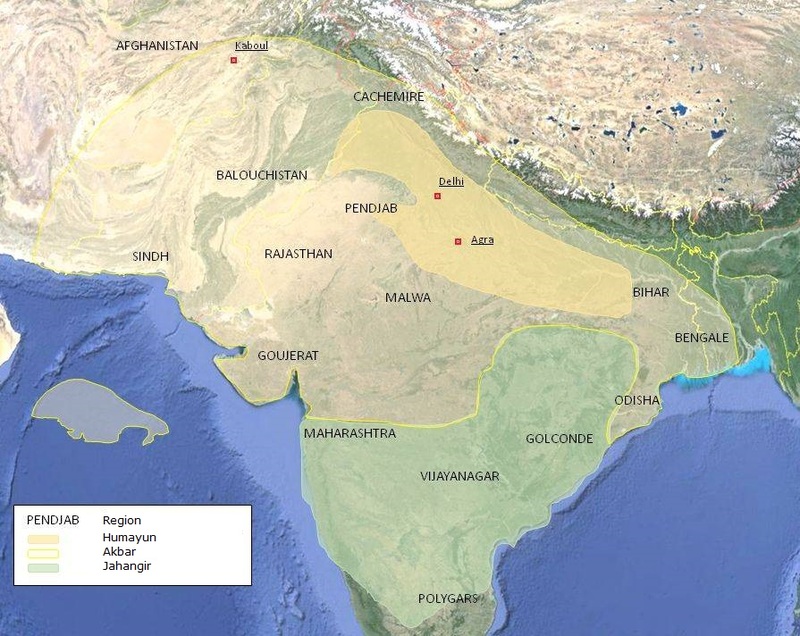 It will stabilize a few years before the successor of Akbar, Jahângîr, launched new conquests to the south, bringing the Mughal territory at its peak. Akbar is the first Mughal emperor to be able to really structure his empire. He begins by dividing it territorially into 15 provinces that he has two administrators: a soldier (the Sudebard, who will later become the Nawab Nazim), a civilian (Dîwân) who is responsible for collecting the tax. He decides to be helped by a council of ministers, himself headed by a vizier, the equivalent of a prime minister. He reformed the judicial system of the Empire, which he retained control by granting himself, as it was done, the last word. He thus had a kind of veto right and could unilaterally decide the fate of the litigants, but this right was nothing compared to the numerous modifications that he implemented in the judicial system. In the area of ​​taxation, it sets a tax on agricultural land of 33%, which seems considerable. In comparison, the European clergy, two centuries earlier, gave themselves 10% of the income from agricultural land. Akbar abandons the jizia, which is a tax on non-Muslims, the tax dedicated to pilgrimages as well as the iqtâ. The iqta is a right not to pay the tax against the financing of military troops. As a result, the nobles, who had troops, were taxed despite the maintenance of the troops. All these tax reforms ended up provoking an uprising in the Empire, an uprising that naturally stopped when the Emperor went back on his reform. From a religious point of view, Akbar has shown great openness. Its aim was to federate at best the different peoples constituting its Empire. Since they were of different religions, he had the idea of ​​creating a new religion containing the best of each. He invited in 1581 Hindus, Muslims, Jainists, Sikhists and even Christians to debate. It revealed the Dîn-i-llâhi, a new religious ideology that Akbar tried to impose on his subjects without much success. His religious practice was quite simple, very far from what his great-grandson will say, which will impose a strict vision of Islam. He makes concessions with religion. It abolishes the tax on non-Muslims (paid until then by Hindus and Sikhs, a large part of the population of the Empire), it authorizes the construction of Hindu temples, and humanizes its population by prohibiting practices of another age, such as the sacrifice of widows (practiced so far by the Hindus). It also prohibits consanguineous marriages. His openness to the religious fact is also found in the choice of his wives (the Mughal emperors are polygamous) He has married several times, sometimes with Hindus, sometimes even with Christians. Besides, his main wife, the one who will give him his son heir, was a Rajasthan princess, Jodha Bai. She came from Rajastan. The main characteristic of Akbar's late reign was his problems with his son, Salim. His father's designated successor, he wanted to become independent more quickly than expected. He settled in Allahabad and formed an army that he launched against the provinces bordering his father (in 1591, then in 1601), declaring himself an independent king. He even struck a coin with his effigy, the supreme symbol of the independence of a kingdom. His father managed to bring him back into his lap, which gave rise to tension, thanks to the widow of the former regent Bairam Khan. Akbar died on October 27, 1605 in Agra. 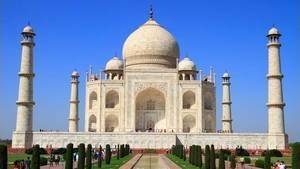 he is buried in a mausoleum tradition of white marble in Sikandra, northwest of Agra. The reign of Akbar is thus characterized by the extension of the Empire, but especially its organization. 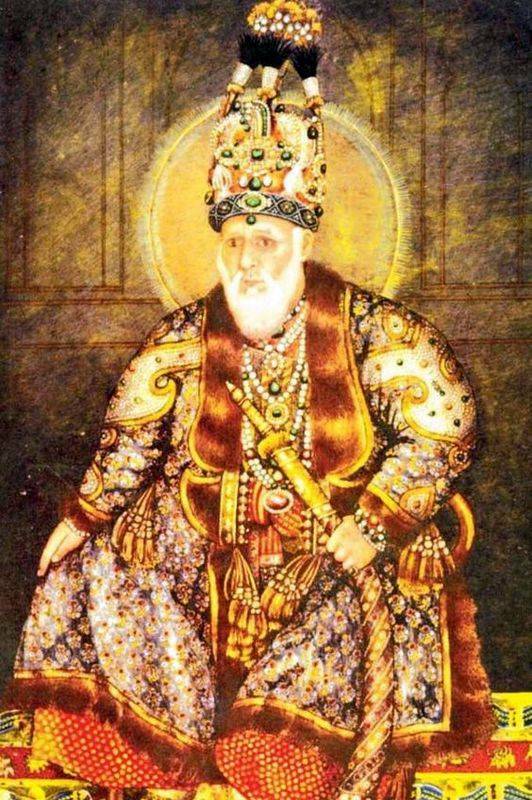 His son Jahângîr inherited it, he will continue the Mughal extension in India.